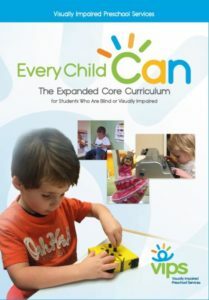 The Expanded Core Curriculum for students who are blind or visually impaired offers a preschool-level perspective on the Expanded Core Curriculum for Students Who Are Blind or Visually Impaired (ECC). The ECC addresses nine critical skill areas these students must learn in order to find success in school and in life. The objective of the video is to demystify the ECC for parents of young children who are visually impaired and for their general education teachers who may have limited expertise and experience teaching children with vision loss. The video also encourages parents and professionals to advocate for use of the ECC and to implement it at home, in the classroom, and in the community. Features closed captioning and audio description for the visually impaired. El plan de estudios principal ampliado para estudiantes ciegos o con problemas de la vista ofrece una perspectiva de nivel preescolar sobre el plan de estudios principal ampliado para estudiantes ciegos o con problemas de la vista (ECC). El ECC aborda nueve áreas de habilidades críticas que estos estudiantes deben aprender para encontrar el éxito en la escuela y en la vida. El objetivo del video es desmitificar el ECC para padres de niños pequeños con impedimentos visuales y para sus maestros de educación general que pueden tener experiencia limitada y experiencia enseñando a niños con pérdida de visión. El video también alienta a los padres y profesionales a abogar por el uso del ECC y a implementarlo en el hogar, en el aula y en la comunidad. Presenta subtítulos y descripción de audio para personas con problemas de visión. This special package deal includes an English version of the ECC DVD and a Spanish version of the ECC DVD. Este paquete especial incluye una versión en inglés del DVD de ECC y una versión en español del DVD de ECC. 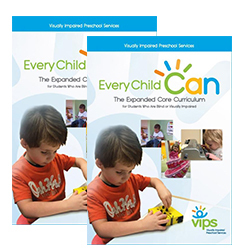 Add this transcript to your purchase to receive a digital copy of the Every Child Can video transcript in English and in Spanish. Follow five toddlers and their parents as we track their development at 6-month intervals, from 24 months to 36 months of age. These are the same children seen in Part 1, including a typically developing child, two children with low vision, and two children who were born prematurely and have significant visual impairements. The series highlights what adaptations the children and parents make to deal with visual impairment at different ages and developmental stages. This series offers parents and professionals a rare opportunity to observe the impact of visual impairment. 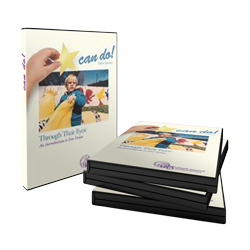 The Developmental Impacts of Visual Impairment--- Buy This 2 DVD set and save $50! Follow five toddlers and their parents as we track their development at regular intervals from birth to 36 months. 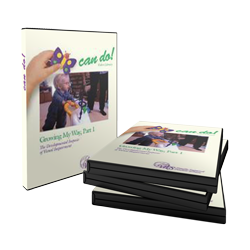 This product is comprised of two DVDs from the Growing My Way installments in the Can Do! Video Library. For more information see the descriptions of Parts I & II above. Parents can be devastated when they learn that their child is blind. 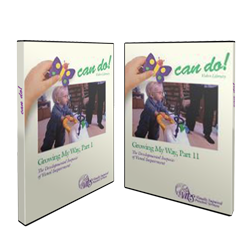 This video is designed to help parents with their sense of loss and develop a positive outlook for their child's capabilities and potentials. It is tempting for parents to do too much for their child who is blind. This video encourages parents to build independence in their child by teaching the child to do things for him- or herself, including feeding, dressing and personal care. Blindness can significantly impact a child's understanding of how to behave with others. 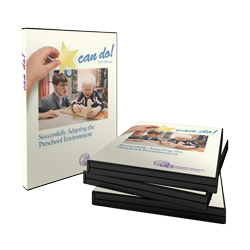 This video explores several areas of potential social difficulty and shows parents how to help their child build the social skills that are keys to successful living in a sighted world. Visual impairment can significantly impact the development of the gross motor skills needed for young children to move beyond their environment and learn about the world. Parents and teachers can play a major role in fostering the development of gross motor skills. This video discusses key gross motor skills and demonstrates simple and fun play activities that parents and teachers can use to encourage a progression of skills from infancy through preschool age. Children who are blind or visually impaired need to be able to use their other senses to gain information about the world. The sense of touch is one of the major senses that can make up for their loss of sight. However, babies, toddlers and preschoolers who are visually impaired need encouragement and opportunities to build their tactual skills. This video discusses the importance of tactual learning, the progression of tactual skills from infancy through preschool needed for preparing children for Braille reading, and how parents and teachers can help. Children who are visually impaired can be successful in the typical preschool classroom. This video demonstrates a variety of adaptations that easily and effectively can be introduced to accommodate the special needs of students who are visually impaired. Anyone can learn Braille! This video features instruction in the Braille alphabet and numbers, introduction to the use of contractions in Braille, and training in the use of the slate and stylus and Braille writer. It is a great tutorial for parents and teachers to get started in using Braille with their children who are blind and to pursue self-instruction at their own pace. Package includes a slate and stylus along with print materials, including "The Alphabetical Index of Braille Signs" and a print copy of each graphic used in the video. Do you have any questions about an event or product? Are you a parent or caregiver looking for more ways to help your child learn and navigate the world? 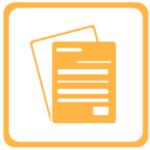 Why not visit our programs and services page to read more about other ways VIPS works to help your child navigate the world!